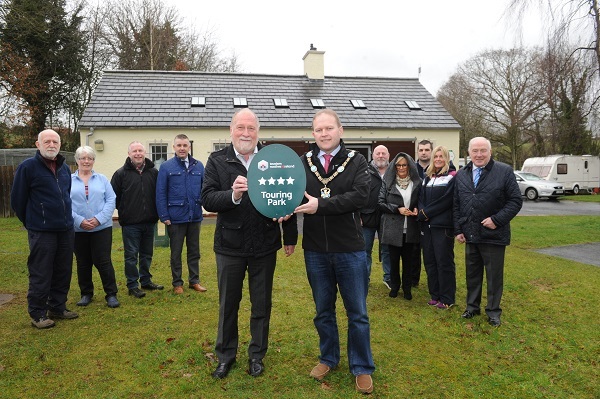 Clare Glen Caravan Park was officially reopened by Lord Mayor of Armagh City, Banbridge and Craigavon Borough, Alderman Gareth Wilson on Friday 16 March in the presence of elected members, John Hill from the British Graded Holiday Parks Scheme and members of the public following recent refurbishment works. The Park had been closed during the months of January and February to carry out the refurbishment work which included upgrading the showers, painting throughout, new flooring installed in the laundry room and throughout the building and the installation of a new aluminium entrance door with mechanical number coded lock. The Caravan Park is set within the beautiful Clare Glen on the banks of the Cusher River and is located approximately 1 mile outside Tandragee on the Markethill road. It includes twenty five touring pitches which are suitable for tents, caravans and motorhomes.